Since 2011, we've been working to create an orchard like no other. An orchard of 365 heritage and connoisseur apple varieties perfectly suited to world-class cider. In 2017, we set out to build a small -- okay, tiny -- commercial cidery able to squeeze the very best out of that unparalleled selection of apples. Now we're ready to bring B.C. 's West Coast its first and only cidery dedicated to producing craft cider that's 100 per cent estate grown and 100 per cent certified organic. It takes time to make great estate grown cider, but we believe it's worth the wait. It takes an orchard this diverse to be able to produce one cider made entirely of heritage European apples, another made solely of heritage North American apples, a third made entirely of traditional English and French cider apples and another made of apples originating in more than 20 different countries, from Japan to Switzerland and from Sweden to Canada. Our remarkable certified organic orchard allows us to do just that. We don't just say we only use apples in our ciders that were grown responsibly and with care; we prove it by growing every one of those apples ourselves. And we do it right here on the same property as the cider is made. We don't just say our cider's organic; we prove it by following rigorous organic standards and paying for independent third party inspections to confirm that's exactly what we're doing. We will never be big, but we promise we'll always be uncompromising. As interest in craft cider grows -- the real thing, made with fresh apples and absolutely nothing artificial -- our combination of carefully selected apple varieties and a patient approach to the whole exercise is set to pay off. We don't ask you to take our word for it; we ask you to put us to the test. Try our cider for yourself; judge whether it really has been worth the wait. Our first vintage, small in quantity but high in quality, is set for release in early 2019. It's exciting that interest in craft cider is booming! At the same time, it's a wee bit sobering to know that interest in cider is far outstripping the availability of apples well-suited to cider. By that we mean apple varieties that are used solely for cider-making, crab-apples and heritage varieties widely used in cider-making for centuries. Since it takes about a decade for new a tree to be grafted, raised to maturity and fully producing, this can't be corrected quickly. As a result, many cideries are doing their best working mainly with modern dessert apple varieties like Gala, Ambrosia, Pink Lady and not-so-good old Red Delicious. This isn't an ideal situation for the cidermaker or the cider drinker. Thankfully, we're in a different situation from most craft cideries. Since 2011, we have been planting and nurturing an orchard perfectly suited to cider and we now have more than 365 varieties of heritage and connoisseur apples happily growing in our orchard. Of our 3,387 apple trees, only nine are Gala, Ambrosia and Pink Lady (also known as Cripps Pink) trees. That's right. Just nine. Most of the other 3,378 trees we're growing are much better suited to cider. And by starting our orchard years ago and populating it with great apple varieties, we've put the fruit first, building the foundation for great cider. Here are some of the 365+ varieties that will go into our ciders. For information on every variety in our orchard, read more about our orchard. When we decided that Ciderworks was going to be 100 per cent certified organic and estate grown, the die was cast: we were going to be a tiny cidery. With an orchard property of just over five acres and barely more than three of those acres plantable, we simply weren't going to be a big producer. And by maintaining our certified organic status, we weren't going to be able to produce as many apples per acre as a conventional orchard might be able to do by pumping in all sorts of chemical inputs. 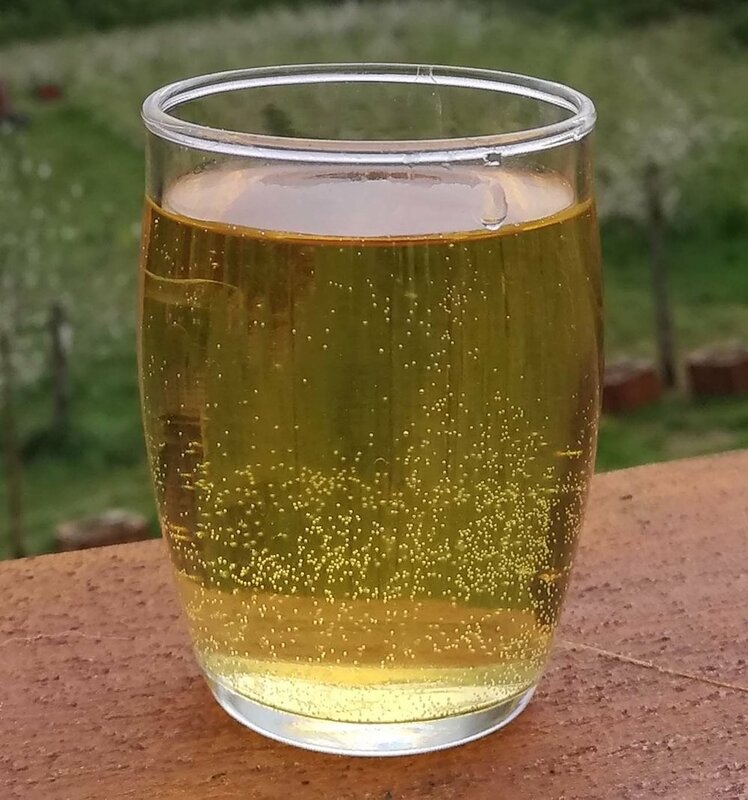 But we're comfortable with being small and we think the folks who drink our cider will agree that it's better to produce tiny quantities of high quality cider rather than large amounts of cider made another way. When we say our ciders are 100 per cent estate grown, we mean that every apple and every drop of juice that go into our ciders come from our orchard at 529 Fulford-Ganges Road on Salt Spring Island, which is where we also make our cider. We don't buy apples from anyone else, we don't buy juice and we certainly don't buy concentrate or flavourings from anyone. We expect to sell almost all of our cider either on the same property or within two kilometers of where the apples in it were grown. If you believe in local foods and if you believe in doing your part to fight climate change, then we're here to help. The price we pay for this commitment is a limit on how much we can produce each year and vulnerability to the vagaries of nature. When we have a bumper crop, we will make more cider and when the growing season is difficult, we'll make less. That's the reality of farming and of growing 100 per cent of our own apples. From the day we started our orchard on agricultural land that was not previously in use for farming, we have been dedicated to growing organically. Similarly, from long before we renovated an existing building on our property to create a cidery, we committed to making cider organically. Because of these choices, we are certified organic both as a grower and a processor. You can read more in our Orchard section on what this means to our farming operation. From a cidermaking perspective, it means we need to follow strict rules about what we put in our ciders and even what we use to clean our cidermaking equipment and building. Our first ciders are slated for release in early 2019. We'll provide more information about them as we get closer to that date.